Does the sequel dino-soar or is it one big Pratt fall? “Yes, it’s the first cautionary dinosaur-trafficking movie — and at certain points you may find yourself ticking off the themes. Greed gone rampant among the globalized gilded class? Check. The sinister potential of genetic engineering? Check. The need to protect endangered species? Check. The privatizing of military action? Check. The eerie implications of cloning? Check. The danger of weaponized dinosaurs? Check. "These movies often literally retread the same ground as their predecessors, encountering layers of detritus from those other movies in the process. (The original Jurassic Park cars are briefly rediscovered here, just as they were last time around.) The thematic work of Fallen Kingdom is scribbly and half-finished, a series of dopey riffs on what came before about humans living with the consequences of their scientific meddling." 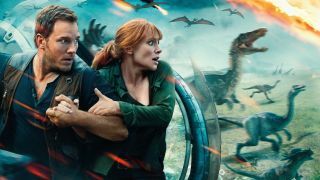 "Here’s the good news: Jurassic World: Fallen Kingdom is more fun than Jurassic World. It’s not exactly a high bar, but still a welcome surprise. In the hands of a new director, J.A. Bayona, with Chris Pratt’s high-wattage charisma on full blast and a fair amount of self-aware humor intact, there are certainly worse ways to spend a couple hours in the air-conditioned multiplex this summer." "While the movie courses seamlessly through different modes, it remains old-fashioned in its treatment of Howard's character, who mostly screams and runs while Owen gets things done. Claire has grown up a lot since her debut as Jurassic World's soulless corporate climber, but she remains a damsel in distress who (this time, as last) gets to perform a single far-fetched heroic feat when things are at their most dire."